At AFA Foundry, we have a unique combination of artists, craftsmanship, and services to help you realize your community and corporate art projects – from start to finish we are the best source for public art. We bring you the broad talents of exceptional and noted sculptors, a staff of accomplished artisans, and dedicated project managers and art curators. AFA delivers the creative flexibility you want and the dependability you need. Our world-class Sculpture Services division can conceive, create, produce, and install site-specific bronze and stainless steel sculpture that transforms your environment. We do it for you, with your approval, every step of the way. On time and on budget. Whether for a public park or private campus, sculpture garden or fountain, seating area or playground, small scale or monumental sculpture, commissioned or existing work – AFA Foundry is your partner to deliver your creative sculptural solutions. For more than 35 years, American Fine Arts Foundry has been providing full-service bronze and stainless steel fine art casting services to the art market. We have an international reputation for precise sculptural detail and excellent client care. 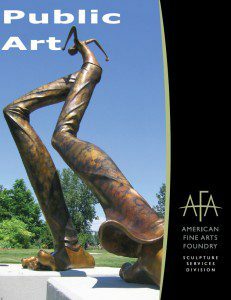 AFA serves over 500 leading artists and art publishers around the world, casting from tabletop size to monumental. Our professional, service-oriented staff of over 25 long-term employees has a proven track record of delivering quality large and small scale projects – on time, on budget, and at competitive prices. We attend to ever y detail, from star t to finish. AFA Foundry is the business partner of choice for clients requiring a qualified, professional co-producer of high quality fine art, delivered to your satisfaction. This public art project required the sculpting of a model and the production of 300 Limited edition sized bronze sculptures. 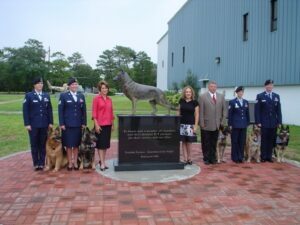 The Limited Edition was sold to fund-raise the creation and installation of a bronze monumental statue of the same image, including the granite base and plaques of the 5 branches of US military service. Project required production of 150 bronze elements to be created within a very short time frame. Project required 18 custom sculpted monumental animal fountains created by integrating bronze and cast concrete, bronze fountain elements, and assorted decorative elements. 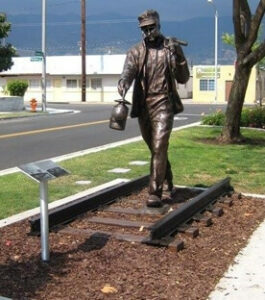 Seven foot tall bronze sculpture project commemorating railroad workers of days past. Project required integrating sculpture on section of old railroad tracks. Monumental bronze sculpture commemorating the film making history in Burbank, CA. The Holy Family bronze sculpture cast in three quarter scale. This project required partnering with the artist to carefully reproduce all the fine detail of the children and the objects integrated into the composition such as game players, firearms, and food packaging. 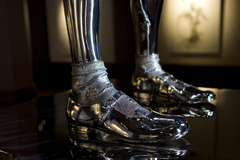 Bronze castings were finished to a very high level of quality and then nickel plated and polished. Thought-Provoking “On the Bench” 17’ Tall Bronze Monumental Sculpture for Public Art Display in Kansas City, MO. 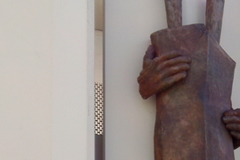 Monumental bronze sculpture created by scanning and milling the maquette sculpture. The digital file was then enlarged to over 17 feet tall. The new scale was CNC milled in foam and then the artist re-sculpted the surface textures and details to match the original model. Molds were constructed of the new enlarged size. The bronze elements were assembled and patinated. The finished sculpture was then created and prepared for transport to its new destination. Life size bronze dog sculpture military memorial. 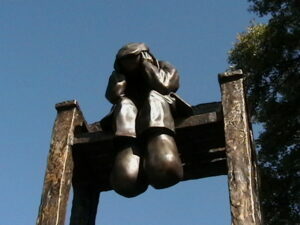 Outdoor public park bronze monumental sculpture. Dancing sculpture. Ten Minnesota Twins Heroic scale bronze sculptures. Bronze sculpture of Minnesota Twins players and management located at Target Field, Minneapolis, MN. Made molds of the artist’s digitally enlarged sculpture and then used the lost-wax method of casting. Each piece was finished in sequence, crated, and shipped for installation to its final destination.